A framed print of the composer had watched over generations of my piano-playing family. Would he ever come home with me? Brahms am Flugel by Willy von Beckerath. As my grandmother distributed her treasures years ago when she was sick, she asked what I would like. 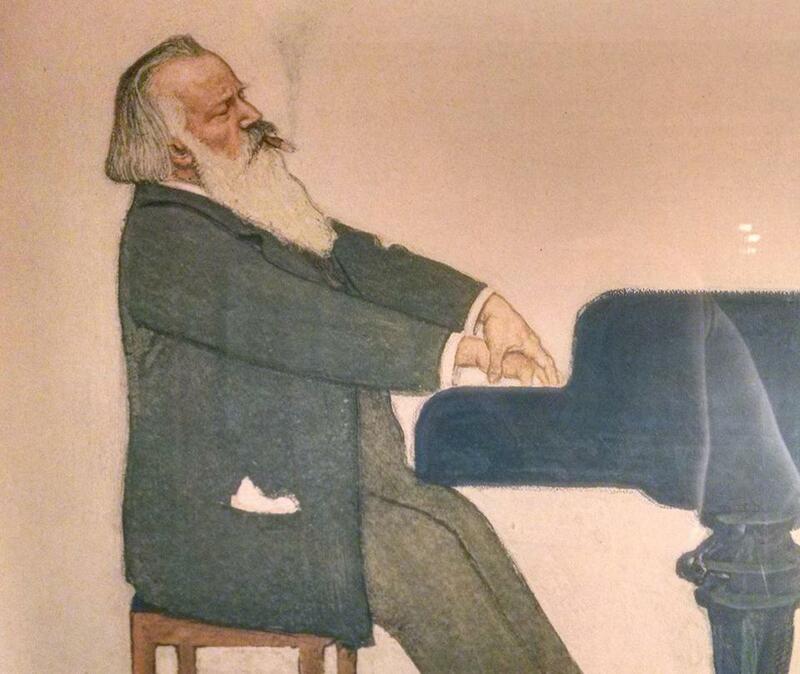 “I’ve always loved Brahms,” I said, looking at the print of the bearded composer, his outstretched hands playing the piano. He was one of my grandfather’s favorites; I had practiced the piano under his benevolent gaze. “Oh, dear — Florence said she wanted Brahms,” she replied. “She always says hello to him when she arrives.” Florence was a good friend of my grandmother’s. I knew she appreciated the picture, but I was 19 and not as generous as I wanted to be. “I can speak to Florence,” my grandmother said. I thought of Brahms once or twice that summer but had other males on my teenage mind. Before I went back to college, my grandmother said, “Florence and I talked about Brahms. She wondered if she could have him now but will note on the back that he’s yours upon her demise, or even earlier. What do you think?” She looked hopeful. “That’s fine,” I told her, and I meant it. It was fair; there were many years left to have Brahms in my house. Years passed, and I was visiting my parents while the kids were in school. I drove downtown, past Florence’s house. My mother had said they were moving to the South. I rang the doorbell, Florence answered, and I reintroduced myself. I was dismayed. “I came to say goodbye; that’s all.” She kept walking toward the living room, where boxes were packed. “I have had him long enough,” she insisted. “It’s time for you.” She wrapped the painting and hugged me tight. I understood what she meant. It was my turn. “Look what Florence gave me!” I unwrapped Brahms at my parents’ house. My father moved closer to look. “Wow, good old Brahms. My dad used to play the piano, and Brahms and I would listen.” I stared at him. He had never said that before. “Do you mean you want to keep him here for a while?” I felt a pinch of impatience. He grinned, picked up the painting, and hung it on his office wall across from his desk. I drove home alone but satisfied. My father enjoyed the painting for a decade. My boys liked visiting my dad, and they’d wave to Brahms. After he died, we didn’t want to disassemble his office. My mother liked seeing Brahms — he was comforting for her. He glanced at me. I started to laugh. I was beginning to understand that Brahms was never going to grace my walls. “Of course you should take it,” I said. “Are you sure?” he asked. I was. I realized I had saved Brahms for the whole family — even those unborn at the time — when I struck the deal with my grandmother and Florence over 40 years earlier. June Cloutier is a writer in Groton. Send comments to connections@globe.com. Get the best of the magazine’s award-winning stories and features right in your e-mail inbox every Sunday. Sign up here.